Selling Poultry Feed Place is a farm equipment used for poultry / chicken eating places. This tool is round or rectangular in shape which has an edge wall around the container so that the feed that is inserted is not easily spilled or out of the container. The place to eat will be hung, where the height of the bottom of the tub adjusts to the height of the chicken's shoulder so that the chicken can easily pick up / peck food from the container. For the number of places to eat needed, for comparison, ideally 1 fruit can be used between 25-30 adult chickens. CV. Mitra Alat Ternak sell poultry feed at low prices and the best quality. 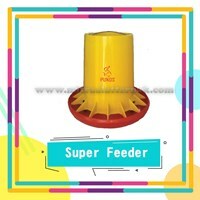 Super FeederSuper Feeder is a tool in the form of livestock feed a new innovation that combines the feed with the protector. The feed is of good quality and multifunctional as it can be used for Broiler and Layer pullet with a capacity of 6 kg.Harganya is cheaper than if you buy a feed and protector. 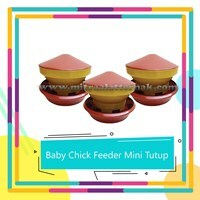 Baby chick feederBaby chick feeder is a breeding tool in the form of a very good feed for chicks aged 1-16 days. 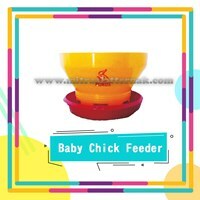 If, talking about chicken feed efficiency when his childhood is very appropriate if you are using baby chick feeder.Why should baby chick feeder? 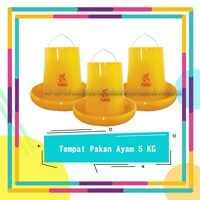 Here are some advantages;excess baby chick feeder, as follows:viewing habits chicks always go up in place of feed, can already be prevented by the use of baby chick feeder, because it has a diameter that is not so wide.To reduce the number of feed contamination as a result of a mixture of husk and chicken manure.Activities rub bakipun, almost no longer done by the breeder.More efficient in terms of feedingthe feed stays clean and hygienic. 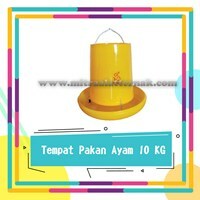 10 Kg Chicken FeedThe feed is made of high quality plastic, designed specifically to feed not much is wasted.This farm tool diameter plate is wider in order to access chickens also eat more, weekend stays clean and easy to clean.Product Specifications:> Grade: Super> Color: Yellow> Capacity: 10 Kg (max. 10, 5 kg)> Capacity: 28-30 chickens broiler / layer. Buat Permintaan Untuk "Places Feed"
A high-quality, high-quality feedstock designed specifically for less wasted feed. 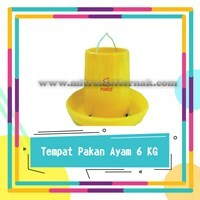 This livestock tool has a wider plate diameter for chicken access that also eat more, week stay clean and easy to clean.The Advantages of Chicken Feeding Place 6 Kg from Mitra Alat Ternak is having 4 Pin and 4 connecting link between bottom plate and upper tube, which if 1 pin chain is released feed will not spill over.Product Specifications & Details:- Grade: Super- Yellow- Capacity: 6 Kg (max 6, 5 kg)- Capacity: 25 - 28 broiler / layer chickenCV. Mitra Alat Ternak is the right company to meet your chicken feed needs. We also provide various types of farm equipment needs with technology that makes your livestock production grow well. Poultry Livestock EquipmentFeeding place is a very important farming tool and should not be forgotten. With a good tool certainly needed to get the results of livestock as expected poultry farmers. Adequacy of chicken feed will certainly affect the health and nutritional adequacy for chicken growth. The need for the feed will be adjusted to the age of the chicken, the more aged the need for the feed will increase and with the large size too.A high-quality, high-quality feedstock designed specifically for less wasted feed. This poultry tool has a wider plate diameter for chicken access that also eat more, feed remains clean and easy to clean. This tool has detailed specifications:- Grade: Super- Yellow- Capacity: 5 Kg (max 5, 5 kg)- Capacity: 20 - 25 broiler / layer chicken. The increasing number of types of poultry feed on the market has an impact on price competition and the quality of products that are different, this will affect consumers' purchasing power of the type of poultry feed to be purchased. Here's how to choose the type of poultry feed that you can try, first you can do is determine the brand of poultry feed you want to buy. Because generally where poultry feed is divided into various types based on the brand, price and specifications. Second, after getting the brand of product you want to buy, you must compare the specifications of the poultry feed you want to buy, if the specifications are the same, then compare the prices of the two brands. Usually for the price of the two brands of poultry feed can be different, of course there is a cheaper one even though the specifications are the same. This is influenced by the number of suppliers or distributors of poultry feed, so this will affect the price of various poultry feed places. That is because suppliers and distributors usually calculate the cost of distributing poultry feed. We are CV. Livestock Tool Partners provide low-priced poultry feed products that you can use yourself or for resale. We serve sales of all customers in Indonesia with the best quality products and services. All products that we sell are selected products that have been tested and proven to have been widely used for companies that have collaborated with us. Get information on the prices of poultry feed and specifications and brands that we sell by contacting through our company contact to get more information. Get product information directly from us to make it easier for you to get poultry feed places that you want to buy easily.